I can't even handle how excited I am that Stella is starting dance class this week! This past week she had a visit to see if she'd like it and as expected, she was in LOVE with it!! Every day since she's practiced dancing on her tippy toes and dancing like a fairy! Since we decided to sign up, she had to get outfitted for her first pair of ballet shoes and a few outfits! A friend suggested Capezio at Inwood Village, and I'm officially obsessed after our trip! There were SO many cute options! We walked away with shoes, tights, two leotards, a skirt, and a dress to start! I can't wait to see how her first real class this week goes!! September 23 kicks off the start of Autumn at the Arboretum here in Dallas and I couldn't be more excited!! Last year Stella had the best time playing in the Pumpkin Village! We went every weekend for a month and she never grew tired of it! If you are in the area and you haven't been, you MUST go! Y'all it is amazing! I have never seen anything like it. They bring in more than 90,000 pumpkins and gourds! This year's theme is Wizard of Oz and is sure to be impressive! I can't wait to take Stella's annual pumpkins pics this year! The display runs through November 22nd!! This past week has been one of the more exhausting weeks of my life. Long days, early mornings, testing, open houses, and general mom life tasks had me inhaling caffeine to keep it all together. This upcoming week is going to be a doozie, too! Fortunately, this drug store concealer is a miracle worker. I've tried so many options, but this Maybelline Instant Age Rewind is by far the best of any drug store or high end cosmetic brands I've tried!! I may have tote bags hanging from my eyes, but at this concealer hides them for me! At only $8 its heaven in a tube! If you live in the Dallas area, Emporium Pies is a must visit stop for a post date night dessert! 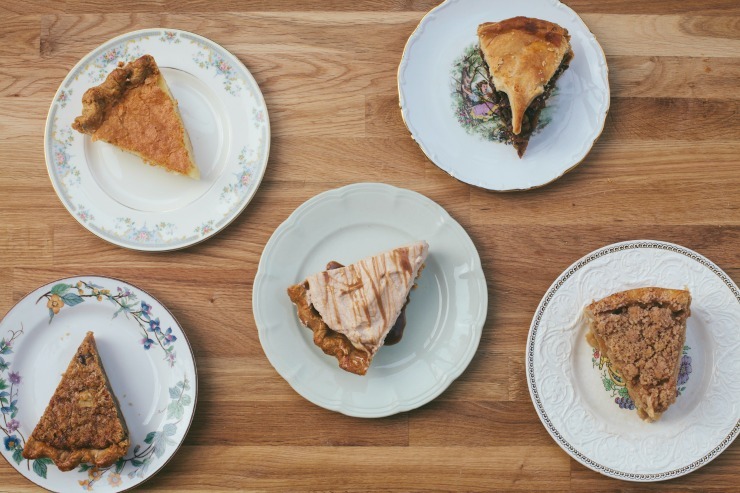 With two stores, one in Bishop Arts District and one in Deep Ellum, they are quickly becoming the area's go-to pie shop! We love everything Emporium Pies makes! Matt decided not to have a groom's cake and instead had their Lord of the Pies at our wedding!! They've officially rolled out their Fall pies and I'm dying to try a few of them! Their menu changes with the seasons, so you have to act quick if you want to try them!! You will not be disappointed!! Stores have officially begun selling pumpkins and I couldn't be more excited! Stella and I planted our seeds a little late this year, and then Matt accidentally pulled our new growth vines because he thought they were weeds when he was weed eating, so we won't be having our own pumpkin patch this Fall! This year I plan on focusing more on white and blue pumpkins for our front porch to tie in with our home decor and my new Fall wreath. I'm going to let Stella pick out her own pumpkins to decorate her playhouse porch! If you're local, my favorite place to buy white/ blue pumpkins is at Central Market or Calloway's Nursery! For your orange variety, Home Depot has a great selection and is our go-to! I accidentally stumbled upon this new documentary on the Laci Peterson murder case last weekend after seeing a girlfriend's post saying she was watching it! I love documentaries, and have recently been watching "The Disappearance of Natalee Holloway" documentary, so I've decided to binge this series as well! I'm a few episodes in, and its interesting for sure. This documentary examines the case and pin points key issues with the investigation and trial. If you're into crime docuseries, I suggest both of these! I stumbled across Smallwood Home last Fall when I was shopping for a Christmas gift for my mom. I've been in love ever since! They have a wide range of adorable signs, perfect for adding a farmhouse touch to your walls. I'm currently eyeing this sweet sign for Stella's room. I love the bright white pop and love that they're so affordable that I don't feel the need to make it myself!! Here's to another great week! !